The art of Photography is first and foremost being at the right place at the right time. I was wandering around and being somewhat creative down near the foot of Duval and wanted to go into some air conditioning at Mallory Square's mall and spotted this bird on the sign. 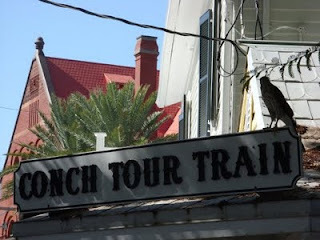 I've grown used to seeing large birds in South Florida but really did not expect to see a hawk sitting in the middle of the touristy thickly settled Old Town. On the other hand, you are very close to the ocean at this spot and there are a lot of small islands nearby so maybe this critter needed a rest.